In January, 2011, the Board of Education proposed a truancy regulation to implement Code § 22.1-258. The Governor approved the proposed regulation on December 29. So I got to do some holiday reading. Please place the following comments in the record of this rulemaking. These comments amend and expand upon my comments of January 2, 2012. I. The CODE Requires the Board to Enforce the Truancy Statutes. That is, if the student continues to be truant, the division is required to file a CHINS complaint or to initiate misdemeanor proceedings against the parent(s). However, the (mandatory) conference is part of the prerequisite notice to the parents: If no conference is scheduled, there can be no CHINS proceeding or misdemeanor prosecution. CODE § 22.1-253.13:7 in the Standards of Quality requires each school board to develop policies to address attendance and enforcement procedures. CODE § 22.1-253.13:8 authorizes the Board of Education to obtain a court order to compel a school division to meet the Standards of Quality or to comply with a plan to accomplish that end. CODE § 22.1-65 authorizes that Board to fine, suspend, or remove from office a division superintendent for "sufficient cause." II. Richmond Is Violating CODE § 22.1-258. 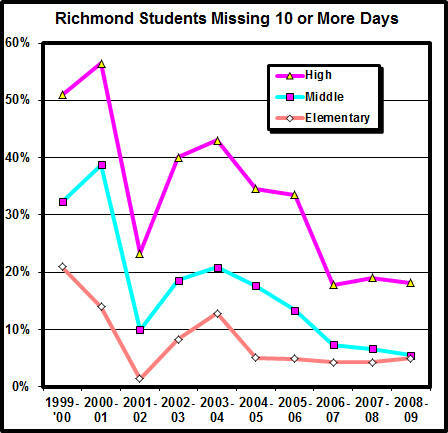 Despite the improvement in 2007, the three most recent reports show nearly a fifth of Richmond high school students were truant ten or more times per year! The graph shows that Richmond scheduled fewer than 20% of the required conferences in 2003, '04, and '05 but improved sharply in 2006 and 2007 (after I blew the whistle on their lawless behavior). I have no data as to absences beyond ten and no direct data (but see below) whether absences beyond six resulted in a trip to court in the cases where the school had scheduled the required conferences; for sure, prior to 2006 Richmond could do nothing about enforcing § 22.1-258 as to the vast numbers for whom they did not schedule a conference. III. The Board of Education May Have Awakened, at Last, to its Duty. In July, 2006, the Richmond Superintendent met with the State Superintendent and the President of the State Board. The PowerPoint presentation Richmond brought to that meeting showed a sharp increase in the number of conferences but was silent as to the followup requirement for enforcement, notwithstanding the shameful fact of almost 2,000 Richmond students with ten or more absences. Starting in 2007, Richmond held over 2.5 conferences per student who was truant 10 or more times. The first implication of that, of course, is that Richmond was fully capable of obeying the law it ignored until 2006, at least as to the required conferences. The second implication is that, as we would expect, the students who make it to ten days truant are less numerous than the number who make it just to six days (about 40%, it seems). The third implication is that the 33%+ drop in 10-day truancies that immediately followed the huge increase in 6-day conferences may reflect a causal relationship. To the point here, the statute requires Richmond to be filing CHINS complaints or prosecuting parents substantially more than 2,000 times per year. Yet the 2010 caseload report from the Supreme Court shows that the Richmond J&DR court was handling fewer than 600 TOTAL domestic and juvenile cases per year in the 2008-10 period. Data reproduced here. The court averaged five abuse & neglect and child at risk cases per year during that period. The statistics are not clear whether the prosecution under § 18.2-371 is a domestic misdemeanor or a juvenile delinquency misdemeanor. In any case, the court handled an average of 60 of the first and 35.3 of the second per year in 2008-10. In short, Richmond may or may not now be in compliance with the conference requirement of § 22.1-258 but it surely is continuing to ignore the enforcement requirements of that law. The documents linked below and attached to this message are responsive to your October 5 FOIA regarding " public records of the VDOE and/or the Board of Education for the past five years that establish, relate to, or comment upon the City of Richmond School Board's compliance with Va. Code Section 22.1-258." The attached Corrective Action Plans are here, here, here, and here. None of those documents, and none of the reports linked above, mentions -- much less reports -- Richmond's compliance (actually, noncompliance) with the conference or follow-up enforcement requirements of § 22.1-258. In short, notwithstanding actual notice of Richmond's ongoing violations of the statute, the State Board of Education has utterly failed to even count Richmond's gross, ongoing violations of § 22.1-258, much less to discharge its duty to compel Richmond to comply with the statute. Fortunately, that is not the end of the story. Early last year, in response to a petition from me (and, probably more to the point, a federal requirement), the Board proposed a regulation that relates to the requirements of CODE § 22.1-258 and that requires the school divisions to record and report their performance under the statute. Unfortunately, as set out below, the proposed regulation is defective. If it is to meet its statutory duty, the Board must repair the draft regulation and adopt it forthwith. In the meantime, the Board has abundantly sufficient cause to fire the Richmond Superintendent for gross and ongoing violations of § 22.1-258. 8 VAC 20-730-10 defines “attendance plan” to mean “steps developed . . . to engage the student in regular school attendance.” Of course, a plan is not steps. It is a design or scheme that might include a list of steps. Parent/guardian involvement, or whole family involvement. A continuum of supports, including meaningful incentives for good attendance and consequences for poor attendance. Collaboration among community actors such as law enforcement, mental health workers, mentors, and social service providers, in addition to educators. Concrete and measurable goals for program performance and student performance. Good record keeping and on-going evaluation of progress toward those goals. The regulation should specify the plan elements that would embody these four components. Where, as here, the statutory language is clear, there is no reason to tinker with it, particularly where, as here, the tinkering creates an overlay of vacuous jargon. VI. The Definitions of “excused absence” and “unexcused absence” are Inconsistent and Defective. The proposed definition of “excused absence” is straightforward and sensible, albeit it does not deal with absence for only part of the school day. If the definition of “excused absence” were repaired to deal with part-day absences, the regulation could then define “unexcused absence” as any absence that is not an excused absence. The “excused” definition implicitly gives the “school authority” the task of deciding whether a particular absence shall be excused. The “unexcused” definition, in contrast, gives that task variously to “an administrator” and to the “school administration.” The regulation does not define any of those terms. The Board should select one term for use in both situations and tell us what it means. [The] Board has the authority to establish policies and procedures to enforce the Commonwealth’s compulsory attendance law. A parent’s awareness and support of his child’s absence from school does not, of itself, allow repeated absenteeism, tardiness, or early departures. As written, the “unexcused absence” definition is not clear that the school, not the parent, shall decide whether an absence shall be unexcused. Moreover, as these definitions are written, a student could be absent for part of a day with the full knowledge and approval of the school administration but the absence could not be “excused.” As well, we cannot tell how much of the day the student must miss to be absent. The statute speaks variously of a student who “fails to report to school on a regularly scheduled school day” and a pupil who “is absent.” In light of the ambiguity in the latter term and, particularly, the dysfunctional interpretation that might be placed on the “parent is aware of and supports the pupil’s absence” language, these two definitions are crucial to the discharge of the Board’s duty to interpret the statute. To this end, the Board’s task of preventing repeated absenteeism, tardiness, or early departures requires definitions that are clear and unambiguous. As I suggest above, the Board should expand the definition of “excused absence” to include part-day absences, to specify what part of the day the student must miss in order to be absent, and to state explicitly who shall make the decision whether a particular absence is to be “excused.” The regulation then can define “unexcused absence” simply to be any absence that is not excused. See this pdf for a more nuanced discussion. VII. The “Multi-disciplinary Team” Is a Nebulous Excrescence. The Board Should Replace It with Specific Requirements for Staged Interventions that Respond to Unexcused Absences and for Accountability for and Evaluation of the Effectiveness of the Interventions. CODE § 22.1-258 provides for development of the five-absence plan by the “principal or his designee, the pupil, and the pupil’s parent.” The statute requires that the six-absence conference include the pupil, his parent, and “school personnel.” 8 VAC 20-730-10 inflates these requirements by creating a new layer of bureaucracy, the multi-disciplinary team, in a flurry of jargon (“integrated system of care”; “early intervention”; “address . . . issues”; “develop, evaluate, and update action steps”). Section 20 provides that a five-absence student “may be referred” to the team and that representatives from the team “may” attend the six-absence conference. Thus we are to have a new layer of bureaucracy with nebulous duties and no clear goals and no accountability. If the Board wishes to create a new organization in the schools, it should at least give some thought to what that organization might do beyond what the statute already requires (e.g., intervene before the fifth absence). Indeed, in light of the very heavy load of the court referrals that will ensue when the Board finally starts enforcing § 22.1-258, the Board should carefully focus any further organizational complexity. The regulation should instead require that each division identify those schools that have a percentage of students with five unexcused absences that is half or more of the state average percentage of students with five unexcused absences. The regulation should further require that each school so identified prepare for the following school year and implement a detailed, written program with an explicit chain of accountability to respond to every unexcused absence with an intervention that addresses the four elements discussed above in Item IV, provides increasing intervention for increased numbers of unexcused absences, and produces written evaluations of effectiveness in each case and overall for the school. The regulation should further require an annual conference in each division of the Superintendent and the principals of all schools so identified to examine the effectiveness of these and the statutory interventions and to adopt measures to increase that effectiveness. Finally, the regulation should require that the annual performance evaluation of every principal and Superintendent include as a major element the performance of the school or division in reducing truancy and that these evaluations be published by the Department, along with the other evaluations proposed in this paragraph and the other data collected under the regulation. 8 VAC 20-730-10 defines “court referral” to mean referral to the J&DR court’s “intake worker.” This considerably understates and distorts the statutory process. A CHINS complaint or misdemeanor prosecution in the J&DR Court is initiated by filing a verified petition. The court’s “intake officer” reviews the petition and may reject it if, inter alia, he finds that the complainant has not exhausted all “appropriate nonjudicial remedies which are available.” That review should be perfunctory in a case where the petition avers that the division has complied with all the requirements of § 22.1-258 and attaches the records of the student’s absences, a copy of the five-absence attendance plan, and the minutes of the six-absence conference. In any event, the filing process is set out in statute and requires no elaboration here. In particular, the regulation’s requirement that “[c]opies of the attendance plan and documentation of conference meetings will be provided to the intake worker” is bureaucratic babble. CODE § 22.1-262 requires evidence of the division’s compliance with § 22.1-258 in a prosecution for a parent’s failure to comply with that statute. Similarly, § 22.1-258 requires evidence of compliance with § 22.1-258 when the division files a complaint against a student. In any event, the filing of any petition under the statute without incorporating evidence of the division’s compliance would be an act of consummate stupidity. The regulation should require that all records of interventions regarding the student’s unexcused absences be attached as exhibits to the petition. IX. The Definition of “Parent” Invents an Unnecessary Term and Ignores the Statutory Definition. 8 VAC 20-730-10 defines “parent” to include a parent, guardian, or “other person(s) having legal control of the student.” In contrast, CODE § 22.1-1 defines “parent” for the purpose of Title 22.1 to mean “any parent, guardian, legal custodian, or other person having control or charge of a child.” The regulation should either quote or cite to the statutory definition, not invent a new one. Moreover, that sentence in 8 VAC 20-730-30 and the two previous sentences are redundant in light of the following paragraph that requires all excused and unexcused absences to be counted. XI. The Process in 8 VAC 20-730-20 Is Beyond the Board’s Authority and May Be Inconsistent with § 22.1-258. The penultimate paragraph of 8 VAC 20-730-20 purports to instruct the J&DR Court’s “intake worker” to either “divert the case or to file the petition for presentation before the court.” Yet the Board has no authority to tell the Court or its intake officer (the CODE does not contain the term “intake worker”) how to process a CHINS complaint or misdemeanor petition. To the extent that this portion of the regulation might be thought to allow the school division to regulate the course of a case, it is contrary to § 22.1-258: The statute requires the division, upon the seventh absence, to (1) file a CHINS complaint or (2) initiate one of two prosecutions. Aside from those statutory choices, the division has no discretion. Insofar as this regulation might suggest otherwise, it is ultra vires. XII. The Board Should Require That Records Be Preserved. The final paragraph of section 20 of the draft regulation provides that the records created under § 22.1-258 and this regulation do not become part of the student’s permanent scholastic record. This provision would permit a chronic truant to move from elementary to middle school or from middle to high school without any notice to the new school of the truancy issue and, thus, without any way for the school to take preemptive measures to deal with the student’s truancy problem. Moreover, this provision might tempt a school to destroy these records that surely would be relevant to a subsequent CHINS complaint or misdemeanor prosecution. The Board should require that these records be preserved and forwarded to a new school as part of the student’s permanent record. XIII. 8 VAC 20-730-30 Contains an Ambiguous Clause. Section 30 requires each division to provide truancy data “as prescribed by the Virginia Department of Education.” If that clause means the Department can prescribe what data are to be furnished, it is nonsense: The regulation itself tells the divisions what information they must collect and furnish. If the clause means the data are to be furnished in the manner prescribed by the Department, it should be modified to say so explicitly. XIV. 8 VAC 20-730-30.E Does Not Require Reasons for the Choice Between CHINS and Misdemeanors. Subsection 30.E requires a report whether a seventh absence leads to a “referral” or petition (the statutory language, as set out above, includes “complaint” and “petition,” but not “referral”) but fails to require the division to set out the reasons for choosing one course or the other. Yet the choice should be driven by the facts of each case. For example, one of the division’s options under § 22.1-258 is to prosecute the parent under § 22.1-262. That latter statute authorizes prosecution for, inter alia, “refus[al] to participate in the development of the plan to resolve the student’s nonattendance or in the conference provided for in § 22.1-258.” Manifestly, if the division fails to prosecute a parent who refuses to participate, the attendance officer should be required to set out a principled reason for not prosecuting. XV. The Data Must Be Public. Particularly in light of Richmond’s wholesale, ongoing violations of the statute and the Board’s gross nonfeasance, the regulation should require the Department to collate the truancy data and publish them on the Web. Indeed, to the extent that NCLB funds are being used to fund Virginia’s uniform management information and reporting system, federal law (PL 107-110, Sec. 4112(c)(3)(B)(1)) requires that the data be public. XVI. The Board Should Fire the Richmond Superintendent. It is manifest that the Richmond City schools are violating § 22.1-258 wholesale and that the Board has done nothing about the violations. The Board should, at a minimum, fire the Richmond Superintendent. XVII. The Regulation Should Create a Clear Path to Enforcement. CODE § 22.1-269 requires the Board to enforce the truancy statute but does not specify a mechanism. At common law, the Board probably has a claim for an injunction against a violating division. Unfortunately, a court might require proof of irreparable harm or inadequate remedy at law. A statutory injunction provides a less cluttered road to enforcement because the plaintiff agency need not prove irreparable harm or inadequate remedy at law. See, e.g., Carbaugh v. Solem, 302 SE2d 33 (Va. 1983). The Board should consider, then, requiring the local divisions to adopt and comply with policies that mirror this regulation. Any failure to adopt or adhere to such a policy would then be actionable directly under CODE §§ 22.1-253.13:7 and -253.13:8. XVIII. The Regulation Should Create a Clear Chain of Accountability. The regulation should require every principle to identify a single individual at the school who is responsible for performing the actions required by 8 VAC 20-730-20 and a single individual at the school who is responsible for collecting and reporting the data required by 8 VAC 20-730-30. The regulation should require that these individuals’ annual evaluations be based primarily upon their performance of these duties. XIX. Section 30 Should Be Clarified and Expanded. 8 VAC 20-730-30 should be expanded to require a summary table such as Exhibit A for each school and should require each division Superintendent to prepare an analogous table for the division. Section 30 also should be expanded to require reporting of the contents of each attendance plan, the results of the plan, the response to any further unexcused absence, the minutes of each conference, the outcome of each conference, and the basis for each decision whether to file a CHINS petition or initiate a prosecution, with a summary for each student similar to Exhibit B. For a more detailed discussion of the evaluation of truancy programs, see this pdf.